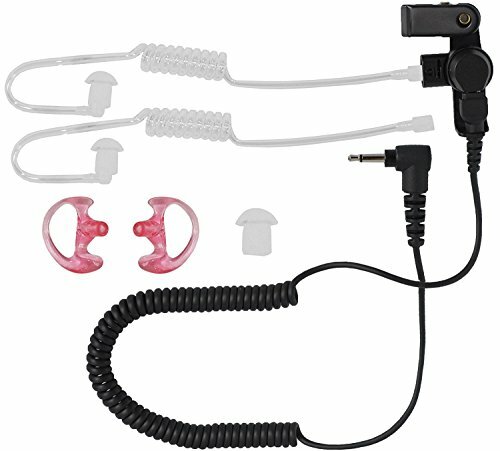 Acoustic Tube Earpiece with 14" cord and 2.5 connector for any radio or remote microphone with a 2.5 mm earphone jack. Compatible with Kenwood radios with a single pin connector. Replacement parts pack include: (1) RACT with an ear-tube connector, (1) standard mushroom ear bud, (1) Medium-Left Earmold, and (1) Medium-Right Earmold. PRIVATE CONVERSATIONS - Keep your communications discreet and get the intel you need to operate effectively. From tactical situations to more professional and recreational settings, when incoming information comes in it should be for your ears only first. The full sound quality transfers from the mic to the earpiece. The first step to answering the call of duty is receiving it loud and clear. BEST VALUE - The Silent radio accessory kit is the best value for installing or upgrading a high quality 2-way radio system. It includes all you need to network effectively except for the radio itself. You'll receive: 14" Wire with 2.5mm Aux connector and adjustable shirt clip, two clear acoustic earpiece tubes, generic mushroom earbuds, and two medium size earmolds for left and right ears. ENGINEERED TO LAST - All of the components are manufactured to endure daily abuse, with thick, durable tubes, and Kevlar reinforced cables to guarantee reliability when you need it most. We're confident in our quality, so you're covered by a 1-Year warranty program as well. MODULAR - Everything is replaceable and upgradable. Gear changes to fit the need of the job, and Code Red has a wide selection of radio accessories you can do your job with precision every time. Whether you're LEO, Military, Security, Fire, Construction, or Paintball / Airsoft, there is a solution for you needs. CODE RED QUALITY - We know there's many choices of radio gear available, but you can be confident that our equipment stands out above the rest. When Code Red gets called out, get the message with Code Red Headsets. If you have any questions about this product by Code Red, contact us by completing and submitting the form below. If you are looking for a specif part number, please include it with your message.